The aluminum boat market is huge and Lowe Boats of Missouri caters to every segment of this market with seven models of deep-V fish boats, nine models of mod-V's, thirteen models in a Roughneck series, twelve different riveted Jon boats, eight Angler utility boats, four Sport Deck models of deck boats, plus fourteen pontoon boats in four series from nineteen to twenty-five feet. If you're counting, that's sixty-seven aluminum boat models! 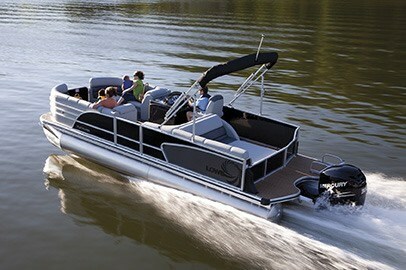 "New for 2012, Lowe® Pontoons introduces an all new game-changer, the Platinum 25 RFL" (Rear Facing Lounge). 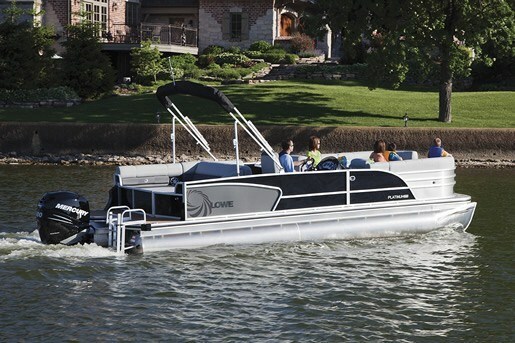 The Platinum series of pontoon boats, the "Flagship" of Lowe's pontoon boats, comprises two models - Cruise and RFL, in each of two lengths – 23 and 25 feet. In normal configuration, they are equipped with two pontoons, each with 3 sealed chambers and full keel and 25" diameter of .080" gauge aluminum. In the case of the Platinum 25 RFL subject of this review, these pontoons are 24-feet long and allow a maximum of a 150 horsepower Mercury® outboard motor mounted on the all-aluminum motor pod. Base power is a 90 ELPT. Optimum power is most likely a 115 hp. However, go for the optional XL Performance Package and you get a third 25" diameter pontoon mounted 1" lower than the outside two pontoons, an under deck spray shield, lifting strakes, a gas tank more than twice as large as the standard tank, and the ability to mount up to a whopping 200 or even a 300 hp Mercury® outboard motor! Now that would be Performance with a capital "P"! This XL Performance Package also gives you increased load carrying capacity in terms of persons and/or weight aboard the boat. But the Platinum series is much more than just about performance. It is all about luxury and you'll find this at every turn aboard the 25 RFL. The "RFL" (Rear Facing Lounge) located on the portside aft corner on the 25 is huge – virtually queen-size with fully padded backrests on two sides. Two or three or even four persons can fully lie down for sunning or relaxing or to simply enjoy the world going by. Facing forward immediately ahead of this RFL is a two or three-person L-shaped lounge. Forward of the portside boarding gate and the starboard side helm console are two more rounded bow lounge seats with "chaise ends." All seating has full storage below. "Soft touch" vinyl with multi-density foam covers all seating. The helm console with storage below is fibreglass-reinforced acrylic with a full gauge package consisting of a tach, speed, volt, trim, and fuel, plus a tinted quick disconnect windscreen, and a fancy Gussi Italia® chrome-spoke steering wheel. The helm chair is a swivel recliner with folding armrests on sliders. A "Chic Plexiglas" oval pedestal table with centre drink holders is standard equipment as are four matching throw pillows. A second table is optional. The standard stereo is a Sony Marine® AM/FM/CD with MP-3, USB plug and four speakers. Thirty-two ounce "custom weave" carpet is standard throughout with "faux teak" or vinyl rear decking optionally available. Retractable mooring cleats and four LED docking lights along with a pop-up privacy enclosure with a mirror are all standard. The 25 RFL has three entry gates; portside, bow and stern with a standard 4-step boarding ladder off the stern gate. A 9-foot bimini top with protective boot cover and quick-disconnect hardware is also standard equipment. A double bimini top is optionally available as is a ski-tow pylon. Pontoon boats have progressively added more and more features and comfort over the years and it would appear that Lowe has gone all out with this new Platinum series in terms of luxury appointments and performance. Check one out at a Lowe dealer near you.